A college “celebrity” joined dozens of excited students as they lined up to collect their degrees at the weekend. 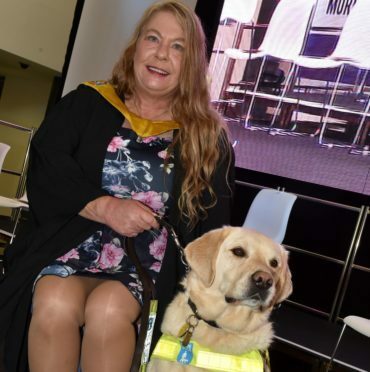 Guide dog Gillan has joined Susanne McCafferty for every one of her social science classes at NesCol’s Fraserburgh campus. And on Saturday, he accompanied her onto the stage as she picked up her HNC. Mrs McCafferty, from Mintlaw is blind and has chordoma, a rare type of cancer that occurs in the bones of the skull base and spine. Having been forced to retire from her career as a nurse, she decided to go back to college to learn something different and gain a fresh outlook on life. The 59-year-old said: “I’m just so proud of myself that I’ve done it. “It was a very hard degree as social sciences is complex but through my political knowledge and experience as a nurse I found it fine. “The teachers were all brilliant with me – they knew I couldn’t sit for a whole hour and they would leave me to get up and move around. “I can’t fault them at all. “Gillan is somewhat of a celebrity though – there were photographs put up in every department of him. Mrs McCaffery with the Rotary’s Endeavour Award after being nominated by her curriculum manager Stuart Anderson who said she had an “impressive diligence and energy towards her work”. More than 100 students graduated from NesCol Fraserburgh at the weekend, picking up HNC and HNDs in accounting, computing, business and social sciences. Principal Liz McIntyre told those attending that the college has gone from strength to strength and has record levels of student success consistently above the Scottish average. She said: “We sincerely hope that being part of the NesCol community in some way enhances their lives, through the support that is offered and through the friendships that are made.